My wife and my move to San Francisco is coming along; over the last weekend we had a big garage sale, I sent a whole bunch of old books to hopefully happy homes (I’ll miss them), and now the house is a half-disassembled mess of poster tubes, half-packed boxes, bits of furniture, heaps of clothing, and so on. Related to my move, I’ve got some news to announce: I’m having a moving sale! All posters and prints at the Mock Man Press store are currently $5 off, including my Walkthrough Map prints of classic Dungeons & Dragons adventures. Speaking of the prints, I’ll be getting them back from the printer in mid-August, and I’m hoping to mail them all out before I skip town in late August. The sale runs from now till August 18, so if you know anyone who’d like some of my art to put on their wall, go check it out! Oh, the drawing! 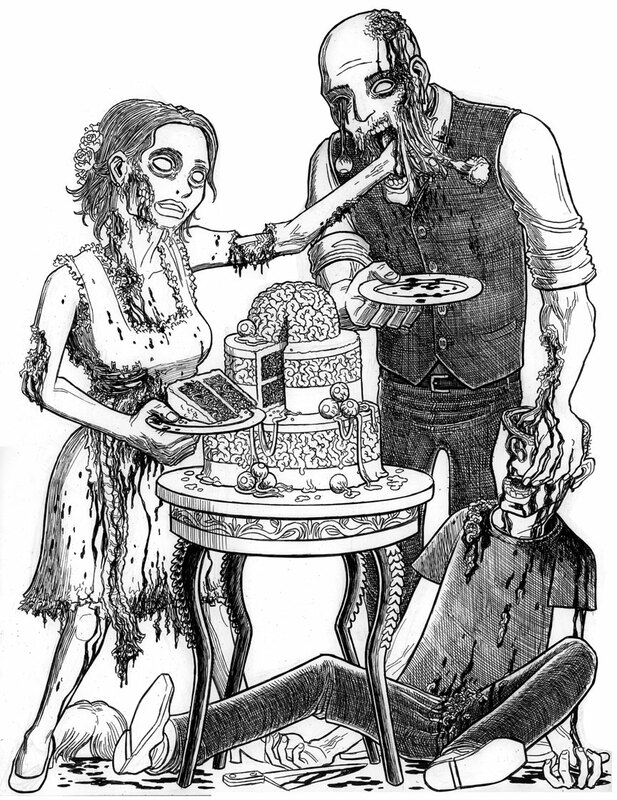 Today’s drawing is another “Zombie Honeymoon” portrait for a “Map of Zombies” supporter. The reference material they gave me was really gory, so I tried to raise the blood and guts level as high as I could while still having the ex-human characters be vaguely recognizable. (I’m not sure I succeeded with the ‘recognizable’ bit, but since you don’t get to see the original photos, you’ll never know unless you’re the person who bought it. -_- ) I drew this in Amman, Jordan, and I had to use different paper stock than usual, since my usual Bristol Board wasn’t available. I admit I don’t like that the tiny sub genre of brain-eaters get top billing over the general flesh eating ghouls. Except that the cry of “BRAINS!” is so memorable. The close in makeup for the “star zombies” in WD are so elaborate an varied that the same actor has played several different ones and is not recognized or recognizable. Yeah, I’m not into brain-eating for its own sake either. Sure, if you’ve eaten through the skull, go ahead, eat the brain, you deserve it. But just to waste all that delicious flesh & gristle and skip straight to the brains — terrible eating habits. No wonder brain-eating zombies are so spacey and sluggish. Perhaps it is because the skull is such a nice little container just crying out to be opened. Or maybe there is a curiosity to see where the screams come from. Although certainly the brain is the least memorable human organ in terms of taste, something I’ve always found quite ironic.